The Studebaker National Museum in South Bend, Indiana, USA displays a variety of automobiles, wagons, carriages, and military vehicles related to the Studebaker Corporation and other aspects of American history. 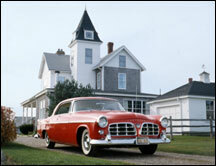 The historic Studebaker family mansion was built by Clem Studebaker from 1886 – 1889. Known as Tippiecanoe Place the mansion is now a fine restaurant. 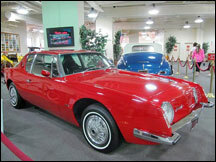 1969 Avanti in a superior collection of rare cars including a 1894 pre-production Duryea and a 1948 Tucker. Also includes the horse-drawn hearse that carried the body of Lincoln, a Kaiser Darrin whose doors slide forward into the fenders, and a 1931 Duesenberg reportedly appraised at more than $1 million. A 1940s style garage housing a unique collection of several hundred model cars, plus 50 cars and 16 bowsers and motorcycles. Includes a good selection of Micro cars such as Goggomobil, BMW Isetta, Messerschmitt and a Suzuki Concept vehicle, as well as an electric Enfield, an Australian built Zeta, an AC Acedes Invalid tricycle and several unusual Studebakers including Avantis. Specialty vehicle with two Avantis in the background. 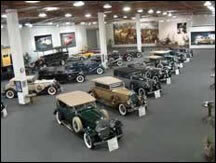 The Vintage Museum or The Chandler Museum was the primary showcase for Otis Chandler's extensive collection of vintage and rare automobiles, motorcycles and trains. The collection was auctioned off in late 2006 and the museum reopened as the Vintage Museum of Transportation, displaying the Peter Mullin Collection, including 12 Bugattis from the former Schlumpf collection. LeMay – America’s Car Museum Featuring a nine-acre campus – with a four-story museum as the centerpiece – ACM, situated atop Tacoma, Wash., south of Seattle and in the shadow of Mt. 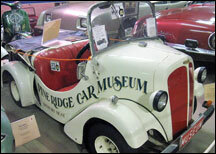 Rainier, is one of the world’s largest auto museums. The spacious facility houses up to 350 cars, trucks and motorcycles from private owners, corporations, and the LeMay collection. Studebaker Avanti 63R-1001 during curent restoration. Old and new dirt track cars and a few restored cars including a 1963 Studebaker Avanti. Rolls Royce's, to 60's – 70's Muscle Cars, European vehicles, 50's classic American cruisin' cars, rare Model T's and Duesenberg's, celebrity cars, cars used in movies, early 20th century cars, even the Pope Mobile! Cars are for sale and are on display temporarily. 1964 turquoise Avanti and 1963 Lark convertible were shown for a time. Open daily from 9:30 am to 11:30 pm. Admission $ 6.95 for adults, $ 3.00 for children 5-11 years of age and $ 3.00 for seniors. Small permanent exhibit that includes a red 1963 R-2 Avanti, limousines owned by notorious historic figures, movie cars, and the battered motorcycle Steve McQueen rode. 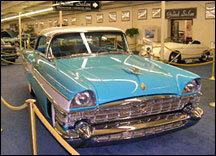 Whatever era of automobiles may be your favorite - from the muscle cars of the 60's to the classic horseless carriages - Don Laughlin's Classic Car Collection has it all.